Find out how professional teeth whitening works and how it can give you amazing results. No matter whether you are about to walk down the aisle or you just want to feel more confident in your smile, there are many reasons why someone may choose to get teeth whitening treatment. Of course, you may have questions about professional teeth whitening before undergoing treatment. Let our Braintree, MA, cosmetic dentists address all of your questions about this popular cosmetic treatment. How long does it take to get in-office teeth whitening? The length of your whitening treatment often depending on the severity of the stains we are treating. Whitening treatment usually takes anywhere from 30-90 minutes. We will also need to clean your teeth beforehand to remove any plaque or tartar buildup. Can I whiten from the comfort of my own home? While there are certainly over-the-counter methods for getting a whiter smile many people don’t see the results they are looking for with these simple drugstore kits. Fortunately, you can also turn to your dentist in Braintree, MA, for at-home whitening. The benefit is that you’ll get a more effective whitening system with custom-made trays (for more even results) that will give you results in as little as one week with continued use. This will depend on several factors including how well you keep your teeth clean as well as avoiding certain stain-producing foods and drinks. You can help maintain a whiter smile longer through healthy smile habits. The average whitening patient can often maintain results for up to one year, sometimes two years; however, you may also choose to get a touch-up whitening treatment in about six months. Who is a good candidate for professional whitening? Anyone with a healthy smile could benefit from professional whitening. Our in-office system is ideal for those dealing with external stains caused by aging, foods and drinks. Sometimes smoking stains can also be improved through our professional whitening. Internal stains caused by taking certain medications (e.g. antibiotics) aren’t as responsive to teeth whitening. It’s also important to note that professional whitening will not brighten restorations such as fillings or crowns; it only works on tooth enamel. 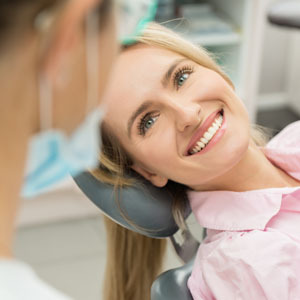 If professional teeth whitening sounds like the right treatment option for you then call our Braintree, MA, dental office today to schedule a consultation with us. Your radiant smile is only one visit away. Turn to Dr. George Salem and Associates today.